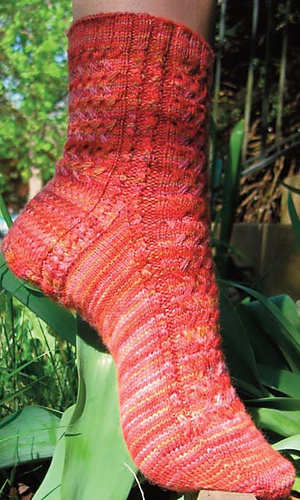 Pattern is designed to show off variegated yarn but made in a solid yarn, the stitch pattern pops. 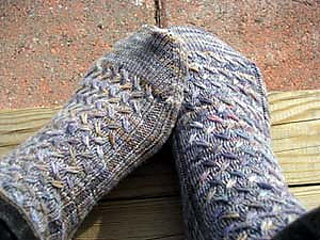 Knit top down, heel flap. 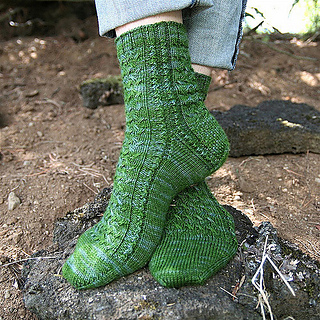 I made a snug US 8 1/2 size sock with a CO number of 74. When Sock Madness 2007 knit this pattern, I discovered I was a tight knitter - most found a CO number of 66 a better fit. Four sizes are provided, but smaller or larger sizes are easy to figure out.